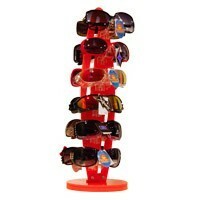 Acrylic Counter top rotating sunglass display rack holds 12 pair in orange color. 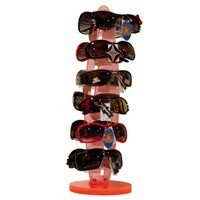 Acrylic Counter top rotating sunglass display rack holds 12 pair in transparent orange color. Height 18.5 in. x Width 6 in. 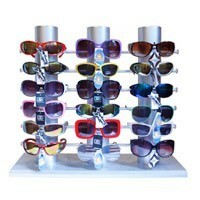 Acrylic Counter top rotating sunglass display rack holds 12 pair in blue color. Height 21 in. x Width 6 in. 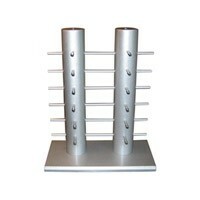 Counter top sunglass display rack holds 12 pair in silver color. This display is pre-assembled. Height 18 in. x Width 15 in. 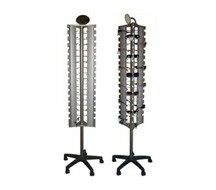 Counter top sunglass display rack holds 18 pair. This display is pre-assembled. Height 18 in. x Width 22 in. 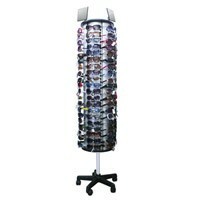 Floor model rotating and locking sunglass display rack holds 48 pair silver in color. This display is pre-assembled. Height 72 in. x Width 16 in. 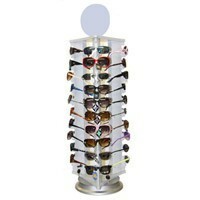 Counter top rotating and locking sunglass display rack holds 30 pair silver in color. This display is pre-assembled. Height 34 in. x Width 16 in. 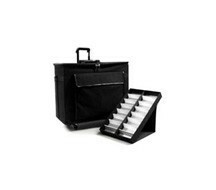 Sunglasses traveling suitcase & displays includes 9 fold up display trays. Each tray holds 16 pair of sunglasses. This display is pre-assembled. Height 71.5 in. x Width 17 in. Some assembly required.